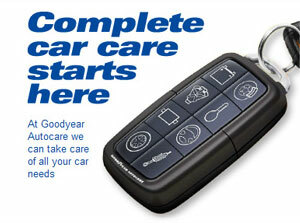 Goodyear Autocare Slacks Creek - Tyres Slacks Creek is famous world over for being at the forefront of tyre technology. From tyres to wheel alignment, Goodyear Autocare Slacks Creek has the expertise to assist you with tyres to suit your needs. If you are unsure of the size of your tyres, Goodyear Autocare Springwood - Tyres Slacks Creek can help you search for the right tyres, as well as provide an extensive range of top brands in Slacks Creek and the surrounding area. Goodyear Autocare Springwood - Tyres Slacks Creek have been providing quality tyres to customers in Slacks Creek for over 18 years now. We offer industry competitive pricing, and no vehicle is too big or small. If you are looking for an expert tyres service in Slacks Creek, call Goodyear Autocare Springwood - Tyres Slacks Creek today. Goodyear Autocare Slacks Creek's range of tyres incorporates technology and advances in tyre design, gathered from Goodyear's research and development teams located worldwide. You can feel confident that Goodyear's tyres are of the highest quality, and with a distribution network that is the envy of the Australian tyres industry, Goodyear Autocare Slacks Creek should be the tyres you choose first. Goodyear tyres are engineered to keep you and your family safe on the road, utilising advanced technology for superior handling, durability and comfort. Our tyres are designed for high performance sports cars, SUVs and passenger vehicles and you can find Goodyear tyres for any type of vehicle and road conditions. Call 13 23 43 today to speak to your local Goodyear Autocare Slacks Creek tyres specialist, who can offer you a range of tyres so that "we'll keep you running" all day, every day.